What kinds of older software do you still use on a regular basis, such as for web browsing? I still use Windows XP quite often (though it's not that old), and Windows 2000 sure has it's uses. What do you guys use a lot that's older? Well, MS-Office 2003 is much easier to use than any of the later versions with that awful "ribbon" UI. Anyway, I still use Microsoft FrontPage 2003 and VirtualPC 2007. There's also WinRAR 4.0.1 too which I've never bothered to upgrade. I liked 2003 for its speed and I was against the ribbon when it first came out, but by the time 2010 came around, I was pretty much used to it. I think Photoshop CS5 is the oldest thing I use regularly now. I'm sure there's something older that I use occasionally, but I can't think of it at the moment. If i want to edit a picture without using Paint.net. I'd use Jasc Paint Shop Pro 8. A good Photoshop clone from 2003. I used to use Paint Shop Pro a lot back in the day. We had a trial version on the family computer of version 8 (I believe), and then when I had my own computer running 3.1, I found an old download of PSP 3.11 and I used that a for all my photo editing needs for a while until I got Photoshop 7 and more modern computers. I'm not sure I'd call it a Photoshop clone though. It's just a competing product. Interesting to see they both came out in 1990 though. I'm still not used to the ribbon, even though I got Office 2007 within a few months of release. In fact that's the newest Office I have. Most of my hardware is running Office 2000/2003 or LibreOffice. Nothing beats Microsoft Bob for utility and ease of use though. They should have made a 32-bit version so I could use it as a Windows 7 shell replacement. Occasionally I use Windows DVD Maker for burning rare TV programs (that have no official home video release) and footage from old VHS tapes to DVD. I guess this could count as "old software" since Windows 8+ stopped carrying the program due to its limited usage. Sometimes, I still use Virtual PC 2007 for older operating systems that don't virtualize well on newer hardware/hypervisors as well as testing old software before carrying it over to my older rigs. On the subject of Ribbon: I grew up with MS Office 2007, so naturally I have nothing against the Ribbon UI. I can easily use the older Office versions as well. I didn't really like the ribbon until 2010. Not sure if it was made better in some way or I just got used to it. If this counts, Paint XP. It's pretty much just the classic Paint specially made for Win7. I prefer it over 7's own pain which to me is more cumbersome to work with, and despised it since day one. Yeah, I'd have to agree with you on that. 7's paint is useless. I just copied the files for paint from Vista and run it on 7. Oh, yea, I also use Paint Shop Pro 4.14 for a lot of things. Keep meaning to check out version 5 or 6 but never get around to it. :P I also use an older version of 7-zip for making archives to ensure they are compatible with different decompressors. Microsoft BOB actually runs nicely under 32-Bit Windows 10. I remember when Office 2007 was pushed out in the office where I was working at the time. NOBODY could figure out where anything was. They had to have massive training classes (a major waste of time and money). More advanced users reverted to using keyboard shortcuts for everything. What a major step backwards. 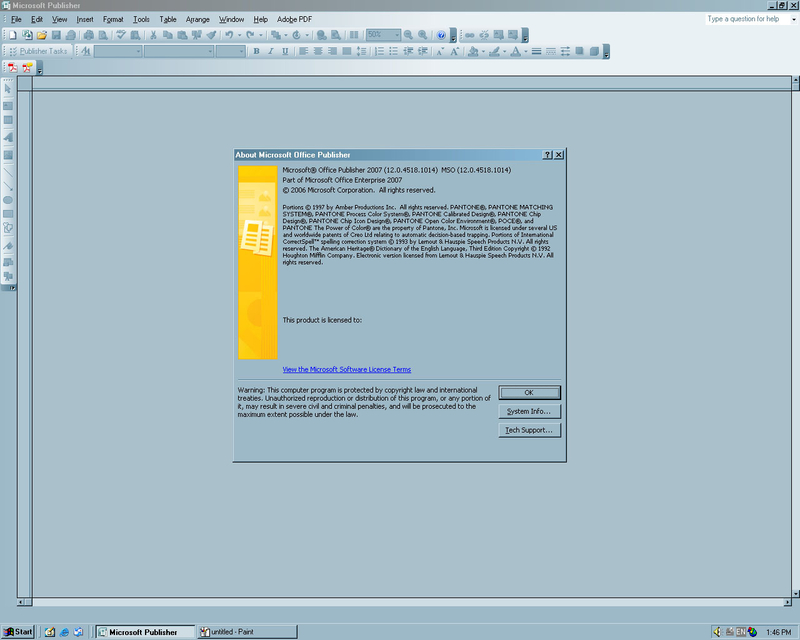 Microsoft Bob works natively in Windows NT x86 since XP (another point for 2000 ). Even got it to work in OS/2 Warp 4 after moving the home.exe executable to the MSBOB folder. I have PSP 7.04 (available on archive.org) and it's still very fast and works nicely under Windows 95/2000. The only real shortcoming is the inability to directly type text on images. Apparently version 8 really messed up a lot of things and changed the interface (like the MS Office ribbon?). I see a lot of people commenting about Office's ribbon UI. I don't mind it. I have used 2007, 2010, 2013 and 2016 and I have gotten used to it by now. I do think that by default it takes up quite a large amount of space on screen, but I can deal with it. And my network is controlled by Windows 2000 Advanced Server, so that and everything it's bundled with (DNS, DHCP, Active Directory, WINS, etc) is used 24/7. Occasionally I also use Netscape 4.79 to manage an old NAS. Turbo C on my DOS machines. Sometimes playing with hardware, it is quite comfortable. Boot DOS, tc.exe, some code, CTRL-F9, runs. This is what I call "rapid application development (RAD)"
Sometimes I use a Pentium MMX laptop with winamp and a VLC that is on there for at least 10 years now. Office 97 to write and print. I have an old HP DeskJet with Centronics only. It still works perfect with those self-refill-sets for ink. Printing PDFs takes ages for this computer. Windows 2000, 64MB RAM, old foxit reader, parallel port is also horribly slow. Palm Desktop 4.1.4 to sync with my Palm m500 (which is running old software such as DateBk6 pretty much exclusively). Lots of stuff on my HP 200LX, which runs MS-DOS 5.0: Lotus 1-2-3 2.4, Turbo Pascal 5.5, and DataPerfect being the main ones. I do come back to a lot of old games from time to time. On some occasions, I'll also take a look back at VPC 2004/2007 and sometimes even old computer emulators (like Softmac or Gemulator). Man, I have quite a few programs I still use sometimes when I somehow end up using them, such as on my older PC running Windows 98, I have Adobe Photoshop 5.0, Adobe Photoshop Elements 2.0, Adobe Acrobat 6.0, Microsoft Office 97, and Internet Explorer 4. The oldest software combo I've got is NT4 packed with Rasterplus 95. This runs on an old dell d600 who drives a polaroid HR6000. The good old days using this thing to convert powerpoint slides to crisp death by kodachrome. Now, I just use it for film experiments. I too use office 2003. It's fast and works. I gave up hope with 2007, and 2013 is horrid. Really, it takes Office 2013 30 seconds to switch from one word document to another? I don't understand why these office programs haven't kept up with the hardware. Even LibreOffice 6.1 and Office 2013 are very sluggish on an i5-7200U compared to Office 2000 on a Pentium M (Windows 95 helps in that case, though, but it's still very fast on win2k). All so we can have some ugly metro UI? I've never noticed modern versions of Office being sluggish on older hardware. I use Office 2016 on Core 2 Duo machines all the time. If it's a Pentium 4, I'd definitely expect it to be slow. Microsoft didn't really design their Office suite to run on such old computers. They probably wouldn't even think people would still be using them anymore. The teachers at my job have Office 2013, running on i5s, and it's dreadfully slow (but I think that might be due to the SMARTboard software they also use, hogging up all the RAM. It's really the biggest piece of s*** I've ever seen). I've also had it screw up documents and someone else had it fail to save a PowerPoint presentation. I never had these issues with 2000/2003. Are they saving documents to the cloud or to local storage? I have seen issues with saving to the cloud through the program itself. Nope, this is local storage. It's just slow in general, not just saving. Extending the premise a little further, my mother's workplace still uses dBase IV on Windows XP. She says that it's very problematic and needs to be restarted frequently. Microsoft didn't really design their Office suite to run on such old computers. They probably wouldn't even think people would still be using them anymore. I'm not referring to older versions of Office. I'm talking about Office 2013 and 2016. For most people, using a Pentium 4 computer nowadays isn't common. I specifically said that I myself use Office 2016 on Core 2 Duo machines, and have also used it on a Core Duo.